Love him or hate him, not a day goes by anymore without Donald Trump making headlines. But the Donald was turning heads and raising eyebrows long before he launched his [fill in the blank] presidential campaign. As CityRealty notes, “Over the years, Donald Trump’s buildings have commanded a premium in New York’s pricey real estate market, with apartments in Trump’s 11 condo towers selling for 31% more, on average, than other Manhattan condos. In 2015, Trump condos have sold for an average of $3 million, compared to the $2.4 million average of other Manhattan condos.” And let’s not forget about his personal real estate transaction when, just last month, he sold his never-lived-in penthouse at Trump Park Avenue for $21.4 million. 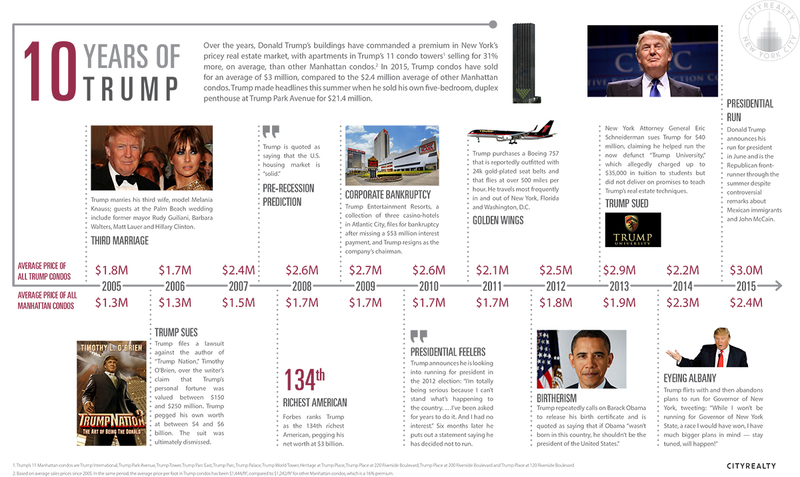 In addition to putting together this data, CityRealty created a fun infographic that details the highs and lows of Trump’s past ten years. From marrying his third wife to filing for corporate bankruptcy to buying a Boeing 757 that’s outfitted with 24k gold-plated seat belts, have a look at the kooky decade that led up to Donald Trump’s one-of-a-kind presidential run.